At Heaven Chemical, sustainability is core to our purpose. We are a global leader in water, hygiene, and energy technology and services. We have an exponential impact on the sustainability of our planet. Heaven Chemical provides a range of innovative equipment that reinvents the way you manage water and energy so you can do more with less. Our product suitable for Comercial Laundry, Industrial Laundry, Hotel dan Hospital. TOXXA is ideal to clean various kind surfaces such as : floor , mirror, window, office equipment, computer, leathers, vinyl, chrome, stainless steel, plastic, rubber, wall, bath tub, exhaust filters, kitchen floor and other good which can be wash with water. Fast acting and effective, rapidly dissolves grease and oil. Safe to use on all surfaces except marble. Rinse freely with out residues. SITRU can effectively remove oils and grime for mirrors, glass windows or glass walls with fast drying properties. 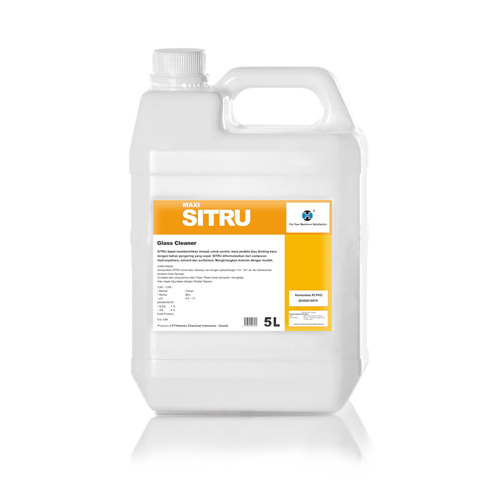 SITRU is formulated from a special blend of hydroxyethers, solvents and surfactants. It loosens dirt and is easily wiped off. Multi –uses- can be used for mirrors, glass tops, wind shields, TV screen, crystal ornaments, etc. SANIPINE is formulated from natural material plus anti bacteria can be used for cleaning floor, bath room, toilet, and garbage areas. Will not harm to irritate skin. Unlike many other furniture polishes, WOODSHINE contains no oily wax which builds up and leaves yellow residue on furniture. WOODSHINE is formulated from a silicone – based. Emulsion which is readily miscible with water. WOODSHINE is free from organic solvents and therefore safe to use on a wide variety of materials that can be used not only on wooden furniture but also on leather, plastic, rubber and metal. Leaves NO waxy, yellowish residues. Provides a beautiful and long-lasting shine to all furniture. Safe on hands and skin. • Apply 2 – 3 coatings to prolong shine and increase protective qualities. Formulated from a synergistic blend of chloro – acids and powerful wetting agents, BRILLIANT is ideal for the rapid removal of brown uric acid stain which tend to built up in toilets and urinals. TOPS is an ideal hand soap that caters to your own taste as it is scented in three different aromas. TOPS is able to clean without drying the skin. It is formulated from soft, synthetic surfactants and skin protecting emollients. Neutral pH safe for skin. Cleans without causing dryness or skin irritation. Using neat with hand soap dispenser. Formulated using blend of anionic and non ionic surfactant, plus anti bacteria and with a fresh fragrance. Being neutral in pH, C-QUAT can be used on all surfaces including marble and aluminum and will not cause undue irritation to the skin. Will not harm or irritate skin. PT HEAVEN CHEMICAL INDONESIA which is concentrate on Cleaning and Hygiene Products established in 2004 based in Surabaya, Indonesia, I extend my profound gratitude and appreciation to all our business associates and customers for your continued support and assistance in improving our company. Standard specification, Easy to use & Environmentally friendly. How to use and End result. We are ready 24/7 for Urgent visit. We trained gradually according to schedule.